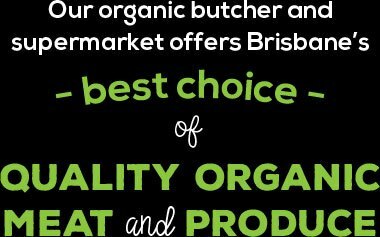 Get the best prices in Brisbane for organic meat, poultry and fish through our bulk / co-operative pricing offer! Get together with a group of friends, a club, or just some neighbours. We do our very best to make sure your order is perfect every time! We are, however, reliant on our farmers and suppliers which means you should keep the following in mind when applying to become a Bulk / Co-operative. We always do our utmost to fill your orders however if you are having a special dinner party or function PLEASE call the store on 07 3353 8541 to ensure availability so you’re not caught short! Wholecuts – depending on the actual cut they can be roughly 3 – 6kgs. The best idea is to put the whole cut required on your order and then ring 07 3353 8541 and they can then advise weight & cost. Once approved they will add it to your order. Please note no individual bagging for any whole cut products. All orders are individually named ready for pick up – no sorting necessary. We accept payment by credit card (including AMEX) and cash on pick up. Registration of a group is open to anyone. Get a bunch of friends, coworkers or club members together and appoint a Group Coordinator who will register your group and, once approved, you can start ordering. Call or email for minimum order requirements.